here’s a little diagram of how I prepare my home oven to bake pizzas. This is a 30″ standard size oven. Your results may vary, but this should get you in the ballpark. Preheat your oven for 45 to 60 minutes, to get the pizza stone up to temperature. and the bottom of your pizza won’t get crispy, and/or your pizza will take f-o-r-e-v-e-r to bake. If you’re one of those impatient types, you don’t have to bake on top of a stone. Just make sure to use an aluminum foil shield on the top rack to protect your pizza from burning on top. I recommend starting your oven at 500 degrees F, then turn down the oven to your target baking temperature once you’ve put your pizza in the oven. Post a comment on this article and I’ll do my best to answer. Looking for a Pizza Stone? Do I place the deep dish pizza pan directly on the pizza stone or the rack just above? I put my pans directly on the stone, but you can do either. 2: do we need to operate the burner on top and bottom of the oven or just the bottom one ? I thought the photo was pretty clear – temp should be between 450 and 465 degrees F, but it will depend on your oven. You might want to bake hotter or cooler. 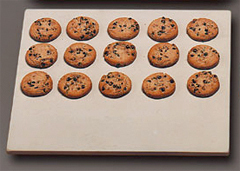 Standard gas oven uses both top and bottom burners when you turn on your oven for baking. You should not turn your broiler on, if that’s what you mean. If you have some kind of oven with separate controls for top and bottom burners, I would use them both for the pizzafication. If your oven only has a bottom burner, you may not need the foil on the top rack. I’m using a professional pizza deck oven. Whenever I preheat my oven to the said temperature, the pizza dough from above starts to burn, the broilers are off but it still burns. Where am I going wrong ? This website is geared for the home baker, so I can’t make any specific recommendations about a deck oven, but I could help you with general troubleshooting if you like. your temp may be too high or you could be baking too long. What size pizzas are you baking and how long do you currently bake them? There are a few people in the Pizzamaking.com Chicago Style Forum who have experience baking with a deck oven. You may want to check in with them and see if anyone has used an oven like yours. I’m using a standard aluminium 12 inches pan, I place the pizza at the centre of the oven and bake for about 25 minutes at the highest temperature. When you say “the highest temperature”, what temperature is that? That is around 608 F, cause I read somewhere to crack up the temperature of the oven to its maximum, so should I use the temperature which you mentioned ? OK. That’s where you’re having problems. When I tell people to max out your oven temp and then turn it down, I am talking about HOME OVENS. Commercial ovens are different. You do need to preheat them for about an hour, but you’ll want to set them to your target temp, which I’d estimate to be somewhere between 425 and 475 to bake deep dish in a commercial deck oven. 600 degrees would be for thin crust pizzas, though that may still be too high for Chicago thin crust. If you’re willing to do some testing, we’d all love to hear about your times and temps baking Chicago pizza styles in a deck oven. Thanks for contributing! I am using a circular ceramic pizza stone I picked up at Target…wondering if there is a big difference in quality from stone to stone? Also is rectangular preferred over other shapes for any reason? Thanks for all the amazing advice and guidance! I’ve only used rectangular stones. I prefer them because it gives you extra room to move pizzas around if you’re baking directly on the stone. Thicker stones tend to break less often and hold heat longer after you’ve preheated them, but most pizza stones work fine if you don’t abuse them. Is this the same for Chicago thin crust? And how long does it take for the thin one? This website is aaaaawesooooome!! 🙂 Thank you so much for teaching us these amazing things! Is what the same? Pizzafication? Pretty much, yes. If you find that your thin crust pizzas aren’t getting enough heat on top, you can always pull out the foil on the top rack. Any thoughts on how to pizzafy an electric oven? With the heating element on top, the shield on the top rack won’t work. I can get it to 500 degrees, but having trouble getting my crust to crisp up. Thanks! Are you saying that you don’t have a heating element on the bottom, only on the top? 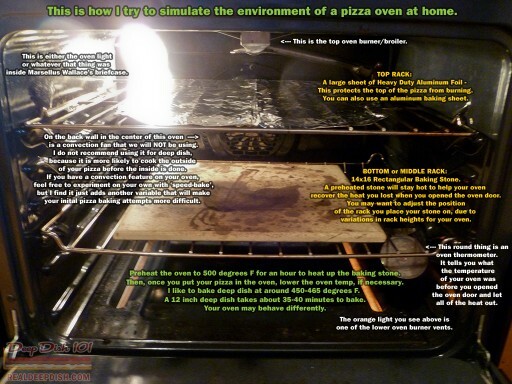 If that’s the case, then I think you can still pizzafy your oven, but you might want to use a baking sheet in place of the sheet of aluminum foil on the top rack to help diffuse the heat a little better, and this would be a situation where having a preheated baking stone (40-60 minutes) will help you maintain the heat on the bottom.